That’s it, Halloween and Bonfire Night have been and gone so we are well and truly in the run up to Christmas. Some of you may be thinking this Christmas post is a little premature, but I must confess I’ve been Christmas obsessed for weeks now. The Christmas season is declared open at the end of our annual bonfire night party where we all gather round my auntie’s house for a firework display at the local park, freshly cooked soup and sparklers. I start planning what I’m cooking and for when! Christmas wouldn’t be complete without gingerbread men, a Yule log, a Christmas cake, mince-pies, shortbread and more! I will be baking ALOT over the Christmas period so keep your eyes peeled. Christmas shopping! This year I started REALLY early buying an extra special present online. Towards the end of November we will make a trip to a big shopping centre where we will shop to we drop and go out for a festive lunch! Operation Christmas Child by Samaritan’s Purse. Every year I take a shoe box, fill it with toys, pens, pencils, notebooks, sweets, teddy bear, hygiene products, hats and gloves and send it off to a Child in a poverty stricken country with the aid of Samaritan Purse! Want to find out more follow this link: Operation Christmas Child. Watch Christmas films. When living at home my Mum and I built up a HUGE stash of Christmas films. It’s now tradition that we watch one a week every week starting in November and right up until Christmas eve when we watch a Muppets Christmas Carol in the morning and It’s a Wonderful Life right after baking our mince pies in the afternoon. We actually own so many Christmas films we can’t get through them all each year and have to be choosey! Singing Christmas Carols. On the first of December I play Christmas music…24/7. It made me rather unpopular in halls but I don’t care! I love ALL Christmas music and even have a favourite Christmas Compilation Album. I’m not ashamed to say it…I know the exact order of the songs and everything…But one of my absolute favourite parts of Christmas is signing in the work choir at the annual Carol concert. We also usually go home for the carol concert at my parent’s church in the second week of advent. Speaking of advent we also have an advent calendar and burn and advent candle every day. It used to be that we would decorate the house two weeks before Christmas but now we do it the first weekend of December (or last weekend of November if that happens to be around the 30th. We always have a real Christmas tree and every room gets decorated. Even the bathroom! The Christmas light tour – this one if a little silly. But if we go back to my parents during December we usually drive around their town doing the Christmas light tour. People go crazy with neon displays in their gardens and giant inflatable Santas on their roofs. Christmas present wrapping – one of my favourite parts of Christmas, wrapping gifts with a Christmas film on. Perfect. Granddad’s birthday party – this may not sound very Christmassy but it’s always the week before Christmas and marks the beginning of a series of family parties over the festive season. Collecting the Christmas turkey! With both Dad and I usually working Christmas Eve, we wake up SUPER early (roughly 5:30am) and head on over to the butchers to pick up our big fat Turkey! This is by far my favourite tradition! The aim is to be first in queue for when they open just before 7am! While there, we choose the cheeses, sausages, streaky bacon, variety of stuffing and extra meat we want for over the Christmas period. The family who run the butchers are so lovely! In the past when it’s been snowing they’ve bought out cups of hot mulled wine to keep us warm! The queue was so big one year we even got in the paper! Making the mince pies – we make our mince pies on Christmas eve. No mince pies until Christmas?! That’s right…we hold into temptation until Christmas has officially arrived! Christmas eve with family friends – this tradition has been going since before I was born! My parents always get together with their couple friends, and us kids are welcome too. We drink far too late into the night/morning so much so that as a child, I always expected Santa to have come by the time we got back home. Leaving brandy and mince pies out for Santa (oh and a carrot for Rudolph too!) This tradition is still going strong! Rudolph loves his carrot, though he always leaves a little bit…complete with teeth marks. Christmas day – a day full of family! We start the morning opening presents, then on to Church where we see the family, before heading home with at least one set of Grandparents and open more presents, then we tuck into Christmas lunch, watch the Queen’s speech, more presents, then I see Jon and his family before heading back to mine for a drink or two. SO, now you know just how special Christmas is to me, can I be forgiven for posting my first Christmas recipe in November?! No?! Well what if I tell you that this recipe is best made in advance (it should be kept in a cupboard for two weeks before using) and can be kept for up to 6 months?! We all that there is nothing better than a home-made mince pie, with a warm glass of mulled wine in front of the fire! 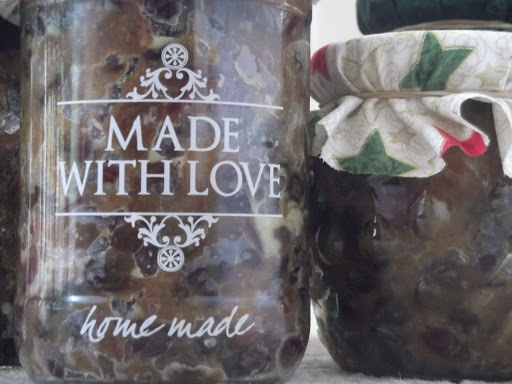 You can use this mincemeat not only in traditional mince pies, but marzipan mince pies and even this delicious Christmas Bread and Butter Pudding recipe. The night before you’re ready to jar the mix up, place all of the fruit and liquids in a bowl. Cover with cling film and leave to rest over night. The next day, wash your empty jars in soapy water, rinse and place in a low oven until completely dried. Place the fruit mix in a large pan along with the remaining ingredients and set over a medium heat. Keep stirring the mixture and continue to cook until the suet has melted and the mixture has begun to bubble. Let the mix cook for 5 mins before spooning into the jars. Pack the mix in well, pop on the lids, and allow to cool. 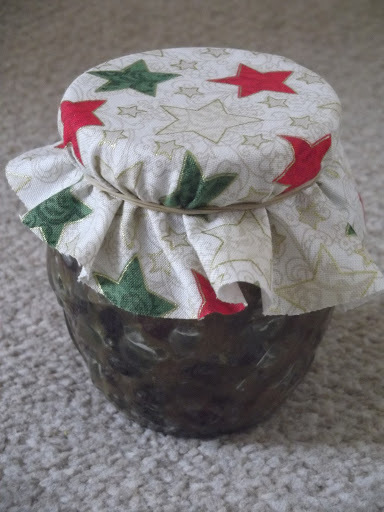 The mincemeat should be stored in a cool, dark cupboard ideally for at least a fortnight (at most 6 months). Top tip: this will fill 4 medium sized jam jars or two large jars. So, are you a Christmas-nut too?! Or am I really the only one out there? Let me know what you’ve got planned for Christmas, cooking or otherwise. Crikey, I can see you are at your element in December! It's interesting to compare notes on mincemeat. I haven't tried pre-cooking it before. Your full jars look lovely. Thank you! Christmas is definitely my time of year 😛 I've always preferred everything about winter from warm jumpers to the hearty food! 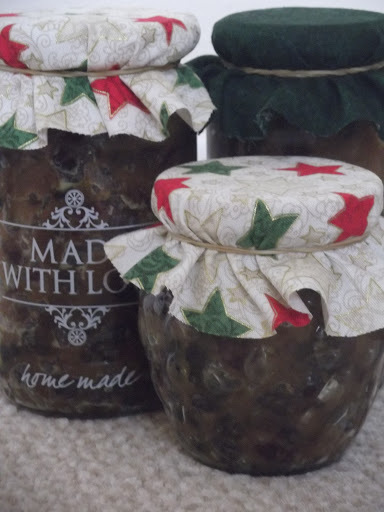 Your mincemeat is definitely going to be made this weekend though! It'll be good to have something different on the table!